Rex Clark recalls the devastation more than two months since losing home. Rex Clark and his wife, Carol, hunkered down in their Florida home during Hurricane Michael, only to have it be destroyed around them. The couple was left with nothing but the difficult decision to move out and move on. Still, this Christmas, the only gift they asked for was to be with family. (Courtesy Rex Clark) Rex Clark said he and his wife lost several trees and their home was destroyed during Hurricane Michael in Oct. 2018. Clark will celebrate the holidays at his new home in Alabama after losing what he and his wife called “the sunshine house” in Panama City, Florida. The light yellow, concrete structure with original oak floors built in 1947 was ravaged by the 155 mph winds and crushing rain of Hurricane Michael. “It wasn’t big, it wasn’t fancy -- but it was ours,” Clark said. When the storm made landfall along Florida’s Gulf Coast as a Category 4 storm, the largest to hit since Hurricane Andrew in 1992, the Clarks decided to hunker down and ride it out. 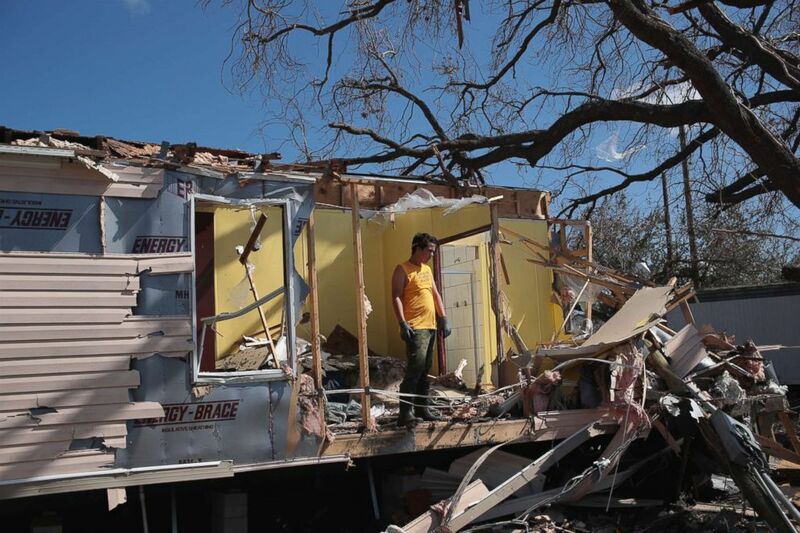 (Scott Olson/Getty Images, FILE) Volunteers help to clear debris left by Hurricane Michael at the severely-damaged Bay Oaks Village trailer park on Oct. 20, 2018 in Panama City, Fla.
Two months later, Clark recalled what it was like to assess the damage and the moment they escaped their crippled house. “At the bottom of our steps is this 150-year-old oak tree that used to sit about five feet from our door. That was the tree that got slammed into our roof, and when the winds had changed direction, it spun off the roof, and that's what took the roof off with it,” he said. 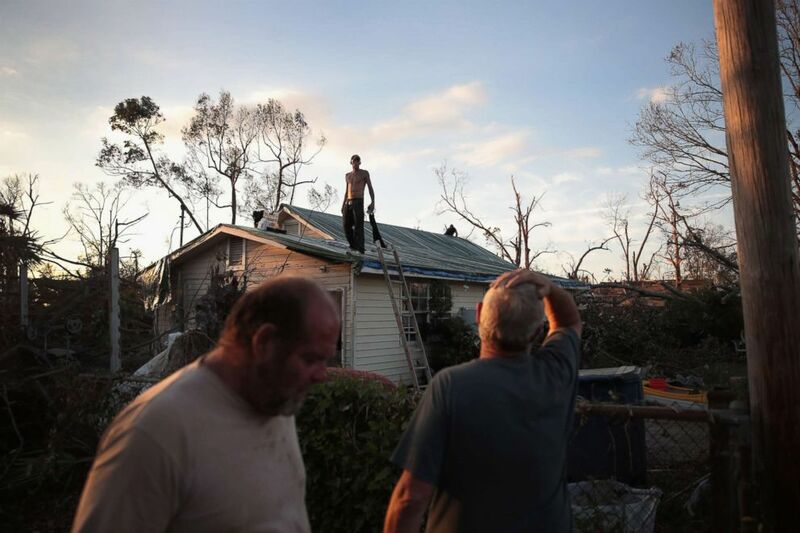 (Scott Olson/Getty Images, FILE) A man helps to tarp a roof on Oct. 18, 2018 in Panama City, Fla. The National Guard and Red Cross came in to help with emergency efforts along with neighbors in the community pulling together as more storms approached. “I can't tell you how much I appreciated what they did. It was this little enclave and everybody helped everybody people helping each other put up tarps,” Clark said. But to Clark’s disappointment, one company, who he said he would not name, tried to take advantage of him and his wife by putting a costly premium on a tarp for their roof. 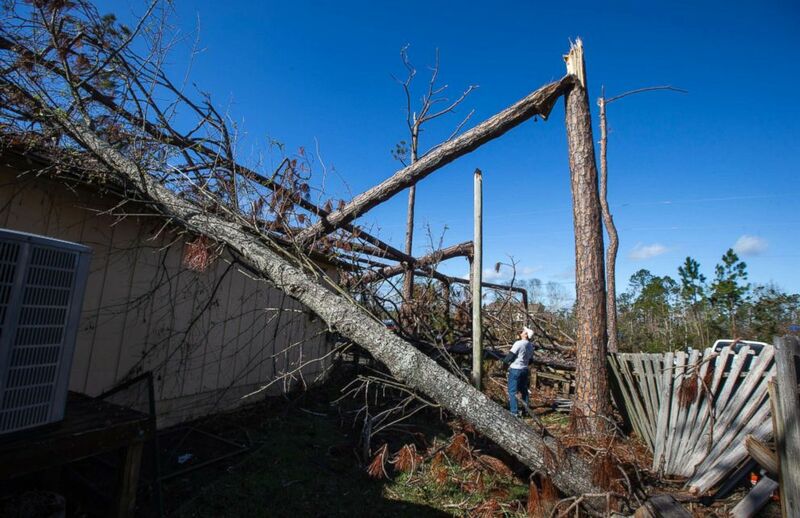 (The Washington Post/Getty Images, FILE) Ten days before Christmas and more than two months after Hurricane Michael made landfall, a resident stands outside his home that was hit by a snapped power pole in Panama City Beach, Fla., Dec. 15, 2018. 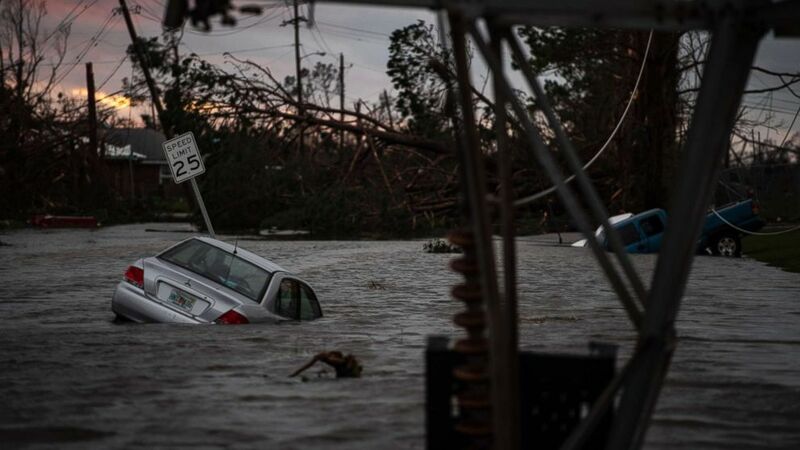 (The Washington Post/Getty Images, FILE) A car is seen caught in flood water after category 4 Hurricane Michael made land fall along the Florida panhandle, Oct. 10, 2018 in Panama City, Fla.
“We just didn’t want the stress of having to deal with it and just came to the decision that Panama City just wasn’t a place for us anymore,” he said. The Clarks moved to Alabama about 50 miles from the Florida border. “We found a beautiful house, we found a nice quiet neighborhood, the people are wonderful. It’s peaceful. It’s giving us a break," Clark said. And after a difficult year, Clark said he “can’t think of a better way to spend” Christmas than with his family. 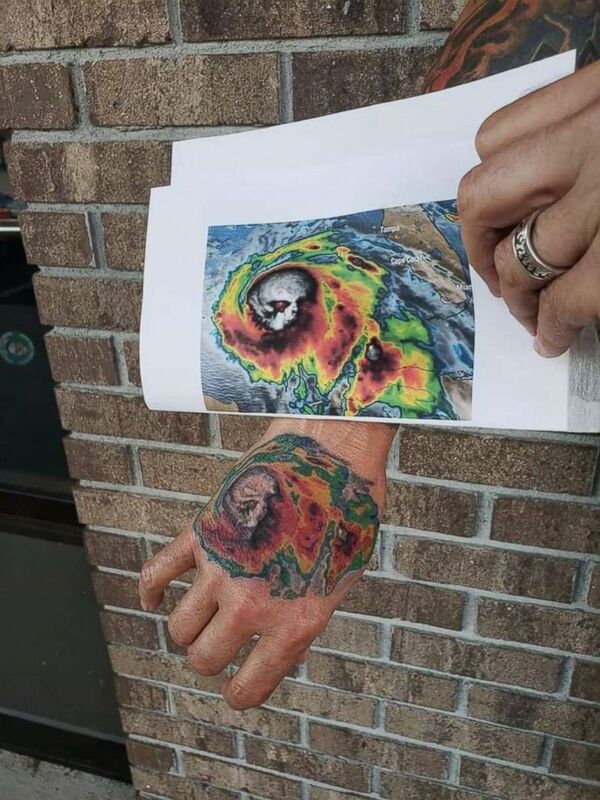 (Courtesy Rex Clark) Rex Clark shows off a tattoo he got on his hand of satellite imagery of Hurricane Michael, which destroyed his Panama City home in Oct. 2018. 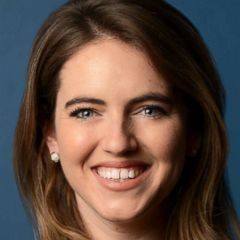 This report was featured in the Dec. 24, 2018, episode of ABC News' daily news podcast, "Start Here."